Big Red Machine, born of the friendship of Bon Iver's Justin Vernon and The National's Aaron Dessner, is less a band than a large-scale collaboration involving dozens of musicians. Justin Vernon and Aaron Dessner are music industry veterans by now: Vernon has been recording and performing as Bon Iver since the mid-2000s, Dessner as part of The National since the late '90s. Along the way, both have had many side projects — and about a decade ago, as part of a benefit album, the two collaborated on a song called "Big Red Machine." Now they've extended that collaboration into a new band and full-length album, also called Big Red Machine — and the scale of this team-up extends far beyond the two of them, incorporating friends, famous musicians and unknown artists all pitching in on a new platform designed to encourage collaboration. "This is all part of something we call People, a large collective and community of artists that's been collaborating for a long time — which is a way to sort of work together and publish music that's sort of outside of the traditional marketing bottleneck," Dessner explains. "Big Red Machine is really a community effort: I guess it involves almost 30 musicians. It does come out of our friendship, but it's really something that is deeply collaborative." Dessner and Vernon joined NPR's Ari Shapiro from a People event in Berlin to explain how Big Red Machine was constructed, and why it often felt best to leave the songs sounding a tiny bit unfinished. Hear their conversation at the audio link, and read on for an edited transcript. Ari Shapiro: The song "Lyla" has this thickly layered background of sounds: percussion, strings, bleeps and scratches. Can you tell me how this came together? Vernon: It started with Aaron making a lot of beats on his iPhone on tour. On that song specifically, there were just ideas that we had: "We want this person to play on this section — I think they would really bring their heart and individuality to this part of the song." Usually we have them record too much stuff, and then we kind of edit it down and mix it all in. Dessner: It's really coming from this place of making music from a communal standpoint, where we weren't trying to be the auteurs of anything. We were really kind of reaching out and embracing this process, leaving the songs open to possibility and interpretation, and kind of intentionally not finishing them. So that's why, I think, the record has that kind of wilder, unfinished, in-process feeling. And that's a lot of this People energy that we're trying to encourage. Shapiro: Is there a tension between the desire to create something that's collaborative and the fact that everybody knows Bon Iver and The National? Some of these other musicians might not be as well recognized, and might kind of feel like they're operating in your shadow a little bit. Vernon: I can speak to that. It's the opposite when we're here. I'm walking around just like everyone else, trying to do as much music as I physically can because that's my dream, that's my love. This is about giving people a different way to think, allowing them to see things in new ways where it's not about who's successful or who's the most popular or who made the most money or something. None of those things really play here. It has nothing to do with why we started playing music in the first place, and [is] very much a reaction to some of the things that have, frankly, made me and Aaron very uncomfortable in the years we've been so-called professional musicians. Shapiro: I should explain — you talked about being "here" — we are speaking to the two of you in Berlin, where you've convened this gathering of musicians who might have collaborated virtually through this platform you've called People, but now this is an in-person meeting. Vernon: Yes. And to be fair, or just fact check, we helped convene some of these people, but the community is so large now, there's no figureheads anymore. There's plenty of people here that I've never met or heard of, and now I'm starting new friendships with them as well. We just really feel like we're all in the mixing pot together. Vernon: I know plenty of people who you might not be able to say are successful in the same way that you're saying me and Aaron are — however, they might be more satisfied on a daily basis than I ever am, because they've been able to navigate pressures and stay in their own cut. Me and Aaron, people know who we are and stuff, and frankly that's not way either one of us ever got into this business — and it's distracting. People start telling you you're really cool, and you get really tired of yourself after a while. So I really would mitigate that term, "success," in almost every way. Shapiro: Just to help us understand what "rawness" sounds like in terms of the music we're listening to, is there a moment in a song that you can point to that might have been finished in a different way, in a prettier way, if you had been making a different kind of album? Dessner: The song "Hymnostic" is kind of a gospel song, and that song is really fun to sing with as many people as possible. And anyone can sing it, you know? Vernon: I think "Hymnostic" could have been done with fiddles and banjos, and it'd almost be better for that song. But we wanted to stick the song on there, so we kind of dressed it up to stand alongside its brothers and sisters, if you will. Dessner: I think the idea is that every time we perform Big Red Machine music it should be different somehow — like, different people, different songs maybe, definitely different versions of the songs. We kind of want to preserve that feeling of possibility. It's less of a band and more of a collection of music that can be conformed. That makes it more exciting, I think. BON IVER: (Singing) Come on, skinny love, just last the year. SHAPIRO: ...And Aaron Dessner as in the band The National. THE NATIONAL: (Singing) I need my girl. SHAPIRO: They first collaborated 10 years ago, recording a song called "Big Red Machine" for a benefit album. JUSTIN VERNON: (Singing) We're safe when the love would come in. SHAPIRO: Now they've extended that collaboration into a new band and full-length album also called "Big Red Machine." And this collaboration goes way beyond two successful musicians. I recently spoke with them from Berlin. And Aaron Dessner explained that this album has dozens of contributors - friends, famous musicians and unknown artists all pitching in on a new platform that's designed to encourage musical collaboration. AARON DESSNER: So this is all part of something we call People, which is really a large collective and community of artists that's been collaborating for a long time, which is a way to sort of work together and publish music that's sort of outside of the traditional marketing bottleneck. So Big Red Machine is really a community effort. I guess it involves almost 30 musicians. And it does come out of our friendship, but it's really, you know, something that is deeply collaborative. BIG RED MACHINE: (Singing) Sign it. Print a new path. Mind it. Well, I would've rolled past. Climb it. SHAPIRO: Aaron Dessner and Justin Vernon explained to me that sorting out who contributed what to the songs on this album is a bit like trying to unweave a quilt. Take the song "Lyla" with its layers of percussion, strings, bleeps and scratches. VERNON: It started with just Aaron making a lot of, like, beats on his iPhone on tour. And we were just hanging out at his house. And on that song specifically, there were just ideas that we had. You know, we want this person to play on this section. I think they would really bring their heart and individuality to this part of the song. And usually we have them record too much stuff, and then we kind of edit it down and mix it all in there. BIG RED MACHINE: (Singing) I'm already off your reservation. DESSNER: It was really coming from this place of really making music from a communal standpoint where we weren't trying to be the auteurs of anything. We were really kind of reaching out and embracing this process, leaving the songs open to possibility and interpretation and kind of intentionally not finishing them. You know, so that's why I think the record has that kind of wilder feeling or unfinished, in-process feeling. And that's a lot of this People energy that we're trying to encourage. SHAPIRO: Is there a tension between the desire to create something that's collaborative and the fact that everybody knows Bon Iver and The National? Some of these other musicians might not be as well-recognized and might kind of feel like they're operating in your shadow a little bit. VERNON: I can speak to that. This is Justin. It's the opposite when we're here because I'm walking around just like everyone else, trying to do as much music as I physically can because that's my dream. That's my love. This is about giving people a different way to think, allowing them to see things in new ways where it's not about who's successful or who's the most popular or who made the most money or something. It's - none of those things really play here. It has nothing to do with why we started playing music in the first place and very much a reaction to some of the things that have frankly made me and Aaron very uncomfortable in the years we've been so-called professional musicians. SHAPIRO: I should explain. You talk about being here. We are speaking to the two of you in Berlin where you've convened this gathering of musicians who might have collaborated virtually through this platform you've called People, but now this is an in-person meeting. VERNON: Yes. Yes. And to be fair or just fact-check, we helped convene some of these people, but the community is so large now there's no figureheads anymore. And there's plenty of people here that I've never met or heard of. Now I'm starting new friendships with them as well. So we just really feel like we're all in the mixing pot together. SHAPIRO: But is that a luxury that the two of you have having been so successful already? VERNON: I know plenty of people who you might not be able to say that they're successful in the same way that you're seeing me and Aaron are. However, they might be more satisfied on a daily basis than I ever am because they've been able to navigate pressures and stay in their own cut. And oftentimes, when you're like me and Aaron, like, people know who we are and stuff. And frankly, that's never why we - either one of us ever got into this business. And it's distracting. And people start telling you you're really cool. And you get really tired of yourself after a while. So I really would mitigate that term success almost in every way. BIG RED MACHINE: (Singing) Holy torch my perdition. How important you'll be. Why don't you lay it down right beside me? Won't you lay it all by me? DESSNER: It was a little bit difficult to decide when they were done from a point of view of not wanting to finish them and the actual sound world of them. We kind of liked the rawness of it and how it felt when we were just making stuff and not really thinking about it. So as you start to mix something and master it - and some of those finishing elements that are part of, like, a traditional process, they felt a little alien to this record. SHAPIRO: Just to help us understand what rawness sounds like in terms of the music we're listening to, is there a moment in a song that you can point to that might have been finished in a different way, in a prettier way if you had been making a different kind of album? DESSNER: The song "Hymnostic" is kind of a gospel song. And that song is really fun to sing with as many people as possible. And anyone can sing it, you know? VERNON: I think "Hymnostic" could have been done with, like, fiddles and banjos, and it'd almost be better for that song. But we wanted to stick the song on there, so we kind of dressed it up to stand alongside its brothers and sisters, if you will. BIG RED MACHINE: (Singing) Winter cost you peace of mind now. Winter cost your valentine. Why won't you come back on the runner? Won't you come right backside? I'll be singing for your health. I'll be righteous; you'll see. SHAPIRO: Does the fact that this was such a collective process involving so many different people make it difficult to perform live or to tour with it? 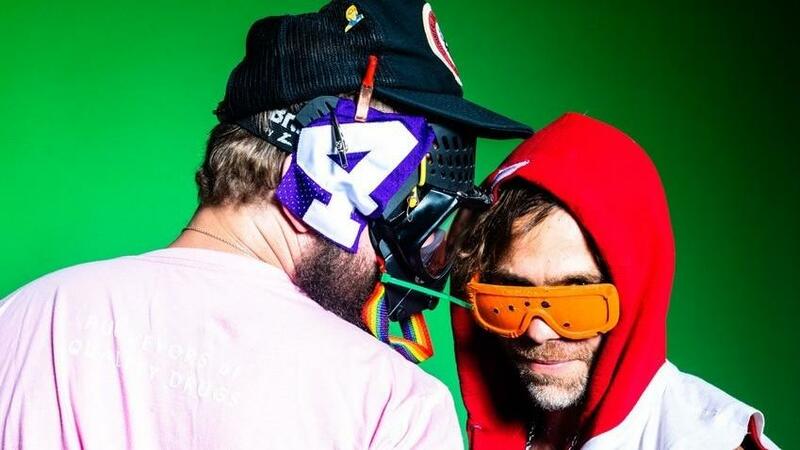 DESSNER: We - I think the idea is that every time we perform Big Red Machine music it should be different somehow - like, different people, different songs maybe, definitely different versions of the songs. And we kind of want to preserve that feeling of, like, possibility. And it's less of a band and more of just a collection of music that can be performed. And so it makes it more exciting I think. SHAPIRO: Aaron Dessner and Justin Vernon, thank you guys so much. VERNON: Hey, thanks so much for supporting People. SHAPIRO: Their new collaborative album is called Big Red Machine. BIG RED MACHINE: (Singing) Well, you are who you are. Well, you are who you are. Well, you are who you are. Well, you are who you are. Well, you are who you are. Transcript provided by NPR, Copyright NPR.